On November 3rd, The Music Cellar was proud to host a "Guitar Talk" featuring our very own Darren Savard. Among many other accomplishments, Darren is the lead guitarist with country superstar, Dallas Smith and was the CCMA's Guitar Player of the Year in 2014. Bass Player, Travis Switzer, added his musical perspective along with some humorous story telling! Travis has twice been named Bass Player of the Year and the two together gave a great presentation! The piano/keyboard department presented our annual Encore 88 event February 3rd and 4th at the Canad Inn. Once again the performers entertained appreciative audiences with a great variely of solos, duets and vocal accompaniment. Congratulations everyone!! The registration process is ongoing! Please feel free to contact us by phone or voicemail regarding lessons and band programs. We'll be happy to provide information and answer any questions you have. We will also be pleased to send you our easy-to-complete registration form which gives you the opportunity to indicate your preferences regarding the day and time of the lessons. Feel free to call now if you are interested in joining us in September. It's been a great year so far and Festival time is right around the corner! TMC's annual Festival lived up to, and in fact surpassed our expectations! Performers were well rehearsed and presented six shows that were truly entertaining and inspiring! What talent.... Wow! The anual Winnipeg DrumTalk Festival will be taking place on Sunday, March 19th from 1 pm - 4 pm at River East Collegiate (295 Sutton Ave). The featured artist will be Mark Kelso, with performances by the Winnipeg Blue Bomber Drum Line and the River East Percussion Ensemble. Mark is one of Canada's most sought after drummers. He is a great musician, singer, producer, composer and band leader. Mark has been featured in the most notable magzines and is an endorsed clinician for Yamaha drums, Paiste cymbals and Evans drum heads. Join us for an inspiring and educational opportunity! And be eligible for some fantastic door prizes!! Congratulations to our students for their excellent results in their Royal Conservatory of Music exams! Preparation takes a great deal of time and committment. Well done!! All six of the Showcase Bands performed at matinee and evening shows on January 15 at CCFM. We had an excellent turnout and the bands sounded great! Five Showcase Bands recorded at Private Ear Recording Studios. Sound engineer Shawn Dealey was very impressed with the quality of preparation and the high degree of talent demonstrated by all the musicians and vocalists. The recordings will soon be available on SoundCloud to be shared with family and friends! It's hard to believe that we are well into the second term at The Music Cellar. The schedule of weekly lessons is very busy, as is the Showcase Band Program schecdule. There have already been many special events, and others are planned. We'll keep you updated as details are confirmed. FOR THOSE STUDENTS WHO ARE INQUIRING ABOUT REGISTRATION, PLEASE NOTE THAT THAT WE WELCOME INQUIRIES AT ANY TIME. Please leave a voice or email message to obtain more information about our programs and we will be happy to answer any questions you may have. Registration is a simple process, so be sure to let us know how we can help! 6 GREAT SHOWS WERE HELD AT CCFM FOR OUR ANNUAL FESTIVAL! Here's just a few of the responses we received.... "Wow! Fantastic! So much fun! What an outstanding display of talent! Beyond all expectations!" Congratulations to each and every performer! Thank you to all who attended! Your support means everything! This past weekend 52 Music Cellar students recorded at the Exchange District Recording Studio. The studio's owner and engineer Shawn Dealey, brought his outstanding credentials to the sessions. The students had an extremely positive experience and Shawn "had a blast working with such very talented musicians!" JAZZ CONCERT DIRECT FROM LAS VEGAS! DIRECT FROM LAS VEGAS... "Combo Prime" performed at CCFM on Wednesday, March 16. This fantastic 6 piece jazz band from the Las Vegas Academy of the Arts put on a great concert! The audience thoroughly enjoyed the band's musical selections and the musicians were thrilled with the opportunity. SHOWCASE BAND PROGRAM- What a weekend! On Saturday, January 23, The Music Cellar's showcase bands recorded and performed. Recording sessions were done live in the Jazz Room at CCFM and will be posted on iCloud once the mixing is done. Matinee and evening performances were held the following day. Both shows were sold out and the response to these very talented musicians and vocalists was outstanding!! 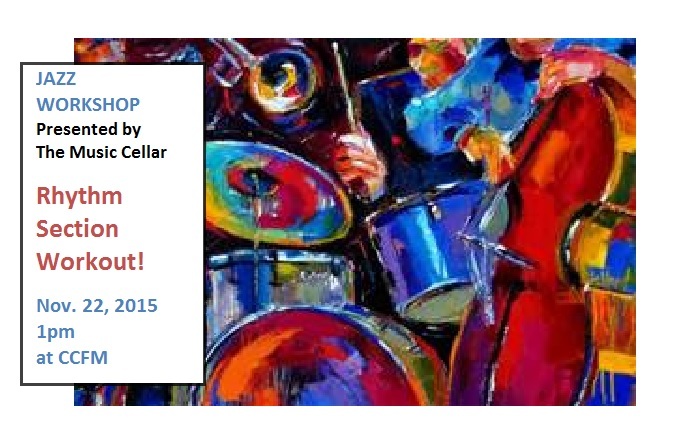 JAZZ WORKSHOP: BASS and DRUMS LINK UP! This workshop focused on developing a strong musical connection between drums and bass in the jazz setting. Feedback from the session was very positive! Lucas Sader (drums), Keith Price (guitar), Luc Guenette (upright bass) and Alex Riel (electric bass) each contributed their perspective by using relevant song demonstrations and audience participation. The plan is to continue with workshops on an annual basis with the hope of being a valuable resource to school band programs. We will respond promptly and provide you with all the information you need. Each and every year, The Music Cellar hosts an educational event featuring a solo artist or a band, who presents exclusively to TMC students. Past events of this nature have been so well-received and it never fails that the audience leaves feeling inspired. This year will be no exception. We'll share the details as plans are confirmed! This year we will be hosting a new concert event called "All About the Bass!." It will feature our bass students performing with a house band. The band will also made up of TMC students who will provide vocals, drums, guitar, and keyboard. As well, The Music Cellar will be offering UPRIGHT BASS LESSONS. We are very excited to welcome Luc Guenette who will be offering instruction in acoustic upright bass. Luc is in his final year of the U of M music program and is a well-respected bass player. With previous teaching experience and passion for his chosen instrument, he will be a definite asset to those playing upright bass in school band programs. This exciting band program, under the direction of Keith Price, is in its fourth year with growing membership. Included in the program is a weekly rehearsal of 60-75 minutes, as well as performance and recording opportunities. Get the "full band experience" including song arrangement, composition, band marketing, stage set-up and tear-down. Auditions were held on Sept. 26 in order to establish the levels of participating musicians. The talent level was fantastic! Scheduling of the rehearsal will be completed this week, with the first sessions beginning Friday, October 9th. For further information regarding drum events at The Music Cellar, please visit our other website: www.winnipegdrumtalk.ca. We offer a very exciting program that is well-known and respected both locally and internationally! Check it out!! IT WAS OUR 30th ANNIVERSARY! 6 Full-Production Rock Shows! Fantastic music and wonderful talent! Congratulations to all of the musicians who performed so well. Thank You to the wonderful audiences who cheered them on! Heartfelt appreciation to all who celebrated our 30th Anniversary with us!! Fesitval 2016 is already booked for June 16-21st. The turnout at the Indicator, Indicator event was fantastic, as was the feedback! The audience loved the songs played by this innovative and energetic pop band. The synched up video and live performance was awesome. And so was the Q and A, with some great questions from the students that were handled with humor and sincerity by the band. One of favorite events of the year, Encore 88, was held at the Canad Inn on the weekend of Feb 6th and 7th. Students performed a huge variety of contemporary and classical music, including several original compositions. The arrangements were well thought out and played with talent and skill! As well, the vocal accompaniment added greatly to the enjoyment of the event!